Sliced, sauced, or cooked in your favorite recipe; tomatoes are a favorite and versatile vegetable. What’s more, they taste best when grown and harvested from your own garden or container. 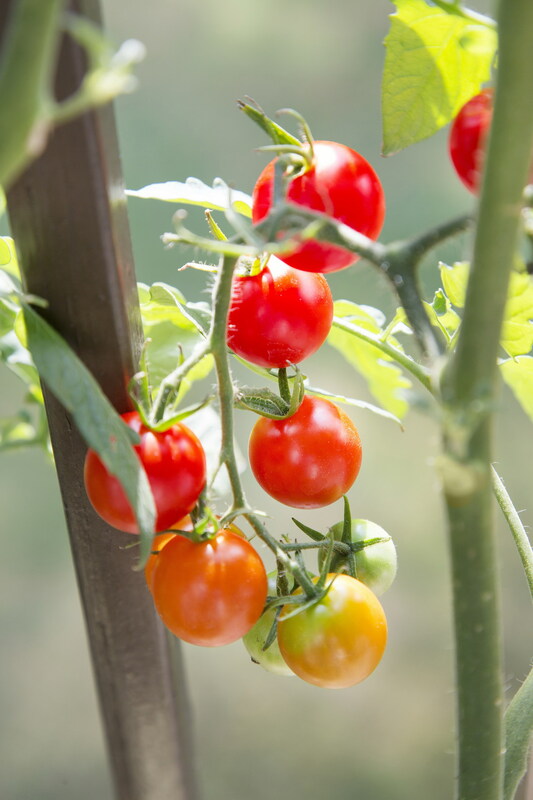 Ensure the best flavor and greatest results by selecting the most disease-resistant varieties and growing your tomatoes in full sun and moist, well-drained soil. Select plants with the growth habit that works best with your garden space and gardening style. Determinate tomatoes are perfect for small-space gardens and containers. They grow to a certain height, stop growing, and produce their fruit over a relatively short timeframe. Indeterminate tomatoes continue to grow throughout the season, producing flowers and fruit until frost kills the plant or you prune off the growing tip found at the end of the main stem(s). Stake or tower the plants to save space, reduce disease and insect problems, and make harvesting more convenient. Further narrow down your selection and grow varieties best suited to the intended use. Plant tags often provide recommendations. Or, save time and do a bit of research before visiting the garden center. The Bonnie Plant Tomato Chooser can help you select the best tomato for your growing conditions and the intended use. Bite-sized tomatoes are great for salads, relish trays, and snacking. Red Robin and Sweet ‘n Neat produce clusters of red cherry tomatoes on compact plants. Grow them in containers or even a window box. Tumbling Tom Red and Tumbling Tom Yellow cherry tomatoes are compact, cascading plants that create an attractive edible display in tall containers, hanging baskets, or window boxes. Grow the explosively sweet Sun Gold and Sun Sugar cherry tomatoes. They’re the candy of the garden and will get even your most reluctant family members, young and old, to eat their tomatoes. Stake or cage these tall plants and, if space is limited, grow them in a 24-inch-diameter pot. Paste and sauce tomatoes have meatier fruit, making them perfect for sauces, soups, and preserving. Roma is the traditional favorite. The egg-shaped fruit has thick walls and few seeds. Use them during the growing season for sauces, chop and add them to an omelet, or can and freeze them for future use. Expand your options with San Marzano heirloom paste tomato. Popular with gourmet and home chefs, the sweet, complex flavor makes a fabulous sauce. Chop a few and add them to salads, or slice and top your favorite sandwich. You’ll enjoy the flavor and versatility of this tomato. Grow a few slicing tomatoes. Most gardeners look for large, juicy tomatoes to enjoy on their sandwiches, hors d’oeuvres, and salads. Look for varieties that are suited to the growing conditions. Solar Flare and Creole are heat-tolerant and keep producing despite high summer temperatures. Start picking tomatoes as soon as 65 days after planting by growing short-season varieties like Early Girl and New Girl tomatoes. An All-America Selections winner, Celebrity, has great disease resistance and is an excellent all-around tomato. Grow this determinate tomato in a cage, or stake the plant to save space. Heirloom varieties have been grown for more than 50 years and have maintained their original traits and popularity. Cherokee Purple’s rich flavor rates high in taste tests. The dusky pink fruit with deep red interior looks as beautiful as it tastes. Add some fun and sweet flavor with Mr. Stripey. The irregular striping of the red and yellow beefsteak-type fruit make this a popular choice. So, gather your favorite recipes and create a list of both longtime favorites and new tomato varieties to include in this year’s garden. Melinda Myers has written over 20 gardening books, including Small Space Gardening and the Midwest Gardener’s Handbook. She hosts The Great Courses “How to Grow Anything: Food Gardening For Everyone” DVD set and the nationally syndicated Melinda’s Garden Moment TV & radio segments. Myers is also a columnist and contributing editor for Birds & Blooms magazine and was commissioned by Bonnie Plants for her expertise to write this article. Myers’ website is melindamyers.com.